Now that the Philadelphia Eagles' offseason is (finally) underway, let's take a look at each position and figure out which players (or coaches, or front office guys) will be back in 2018, and which ones will be playing (or coaching, or wheeling and dealing) elsewhere. Here we'll look at the general manager. The Eagles improved from back-to-back 7-9 records in 2015 and 2016 to a 13-3 mark this season as Philadelphia returned to the playoffs for the first time since 2013. Roseman has overseen the reshaping of a roster that included two separate trades that helped Philadelphia move up to select 2017 PFWA All-NFC team quarterback Carson Wentz in the first round of the 2016 NFL Draft, another trade that yielded 2017 first-round pick, defensive end Derek Barnett, who earned 2017 PFWA All-Rookie team honors, and solidified the team’s core by retaining key veterans. Prior to the 2017 season, he added to the team through free agency as the Eagles signed quarterback Nick Foles, defensive end Chris Long and wide receiver Alshon Jeffery and made a pair of trades that netted defensive tackle Tim Jernigan and cornerback Ronald Darby. The Eagles also had three 2017 PFWA All-NFL selections: center Jason Kelce, offensive tackle Lane Johnson and defensive tackle Fletcher Cox. Roseman's award had as much to do with his wheeling and dealing the previous offseason to acquire Carson Wentz as it did his great 2017 season, in which he surrounded Wentz with a slew of pieces that would help the Eagles win the Super Bowl. Below we'll take a look at all of the Eagles' most crucial transactions in 2017, in chronological order. To note, the contributions of Joe Douglas and the Eagles scouting department, which NFL Network analyst Daniel Jeremiah called the best in the NFL, certainly contributed to the Eagles' outstanding year in the front office. • Released CB Leodis McKelvin (2/8/17): McKelvin was cooked, and carried a significant cap hit. No-brainer. • Released DE Connor Barwin (3/9/17): Barwin was a great locker room guy, but his cap charge was far too lofty for his production. Again, another no-brainer. • Signed WR Torrey Smith to a three-year contract (3/9/17): The Eagles took a calculated gamble on Smith, who had a pair of down years in San Francisco. Smith was better with the Eagles in 2017, but still inconsistent, as he dropped too many passes. The Eagles were smart enough to give themselves an out after one year if Smith did not excel. • Signed WR Alshon Jeffery to a one-year contract (3/9/17): Jeffery found an unexpectedly soft wide receiver market, and the Eagles capitalized by signing him to a very reasonable one-year deal. Once he gained rapport with Carson Wentz, Jeffery began putting up big touchdown numbers during the regular season. After the switch to Nick Foles, Jeffery starred in the playoffs, making a number of high-difficulty catches in big moments. • Signed OG Chance Warmack to a one-year contract (3/9/17): Warmack was outplayed by Stefen Wisniewski, but was still a competent backup with some upside. • Signed OG Stefen Wisniewski to a three-year contract (3/10/17): I was personally taken by surprise by the Eagles' re-signing of Wisniewski, who turned in a very good season as the Eagles' (eventual) starting LG. • Signed QB Nick Foles to a two-year contract, and released Chase Daniel (3/13/17): The Eagles burned a lot of salary cap space when they signed Foles, and subsequently released Daniel. That costly backup quarterback shuffle ultimately panned out in a big way, obviously, as Foles earned Super Bowl MVP honors. • Signed DE Chris Long to a two-year contract (3/28/17): The Eagles signed Long several weeks after the start of free agency began. During the regular season, Long had 5 sacks and 4 forced fumbles. In the playoffs, Long generated perhaps the biggest play in the NFC Championship Game, when he affected a Case Keenum pass that was returned for a touchdown by Patrick Robinson. Behind the scenes, Long was also a well-liked player in the locker room. • Signed CB Patrick Robinson to a one-year contract (3/28/17): Later that day, Roseman signed Robinson, who ended up being one of the best slot corners in the NFL. • Signed Trey Burton to one-year RFA tender offer (4/3/17): The Eagles placed a relatively high 'second round tender' on Burton, which wasn't a no-brainer at the time. But after a productive season and the Eagles in a good position to receive a compensatory pick if Burton walks in free agency this offseason, that move was clearly the right call. • Traded a third round pick (74th overall) to the Ravens for Timmy Jernigan and a third round pick (99th overall) (4/4/17): The Eagles needed to bolster their interior defensive line, and all it cost them to add Jernigan was draft position in the third round, where they ended up getting a good looking rookie prospect anyway in Rasul Douglas. • Drafted DE Derek Barnett, CB Sidney Jones, CB Rasul Douglas, WR Mack Hollins, RB Donnel Pumphrey, WR Shelton Gibson, LB Nate Gerry, and DT Elijah Qualls (4/27/17 - 4/29/17): Barnett is clearly a starting-worthy defensive end in the NFL, and Sidney Jones remains the 'X-factor' of this Eagles draft class. We'll get a better idea of what he is in 2018. Otherwise, it appears early on that Douglas and Mack Hollins were both good values where the Eagles got them. • Signed Corey Clement as an undrafted free agent (5/11/17): Clement was a quality third down back for the Eagles, who saved his biggest contributions for the Super Bowl, when he went off for 100 receiving yards and a TD. • Signed RB LeGarrette Blount to a one-year contract (5/18/17): The Eagles picked up Blount in May, for virtually nothing. He ended up being a good player and great teammate, despite character concerns. • Signed Jason Peters to a one-year contract extension (6/14/17): Peters didn't want to go into every offseason wondering if he would be released, so the Eagles did him a solid by giving him job security through at least the 2017 season, and likely 2018. The Eagles got some immediate cap relief in the process. Obviously, they could not have predicted his ACL tear. The bigger concern at the time was whether or not he would experience a dropoff in play, which did not happen. • Traded Allen Barbre to the Denver Broncos for a 2019 conditional (likely 7th round) draft pick (7/26/17): The Eagles were going to release Barbre, when the Broncos reached out and said they'd toss the Eagles a late pick in 2019 instead. • Traded a 2018 third round pick and Jordan Matthews to the Buffalo Bills for CB Ronald Darby (8/11/17): The departure of Matthews opened up the slot for Nelson Agholor, who rewarded the Eagles with by far his best season in the pros. Meanwhile, Darby represented a legitimate NFL started corner for a team that (at the time) was desperate for one. Darby's season went a little sideways after a gruesome injury Week 1, but he came back and made some very big plays for the Eagles down the stretch of the regular season. • Released Ryan Mathews 8/15/17) Again, no-brainer, though it took a while. • Traded Matt Tobin and a 2018 7th round pick to the Seattle Seahawks for a 2018 5th round pick (8/21/17): Lol. I still can't believe Howie got anything for Matt Tobin. • Signed DE Steven Means to a one-year contract extension (8/30/17): This was an interesting move. Perhaps Vinny Curry insurance? • Signed OG Chance Warmack to a one-year contract extension (9/2/17): The Eagles extended Warmack before he ever played a game for the Eagles, which signaled that they liked what they saw of him in training camp and the preseason. Warmack provided competent depth at guard. • Signed K Jake Elliott off the Cincinnati Bengals’ practice squad (9/12/17): Credit the scouting department's knowledge of Elliott, who the Eagles signed once Caleb Sturgis went down. Elliott ended up being a great find, and he'll clearly be the Eagles' kicker going forward. • Traded a fourth round pick to the Miami Dolphins for RB Jay Ajayi (10/31/17): The Dolphins are the gift that keep on giving. In 2004, the Eagles traded A.J. Feeley to the Dolphins for a high second round pick. In 2017, Roseman traded a pair of players they didn't want in Byron Maxwell and Kiko Alonso, along with the 13th overall pick, for the 8th overall pick, which helped land them Wentz. And then in 2017, the Eagles added Ajayi for the low cost of a fourth round pick. Get Miami on speed dial. • Signed DT Timmy Jernigan to a four-year contract extension (11/9/17): Jernigan started the season strongly, but he faded a bit down the stretch. • Signed LB Dannell Ellerbe (11/13/17): Ellerbe ended up being a 'starting' linebacker after the team placed Joe Walker on IR. • Signed WR Alshon Jeffery to a four-year contract extension (12/2/17): The revelation that Jeffery had a torn rotator cuff made this contract extension a very curious one, though certainly, Jeffery's play on the field warranted it. • Signed ST Bryan Braman (12/12/17): And finally, even Bryan Braman, who the team added very late in the season, made a play in the Super Bowl, when he tackled a Patriots kick returner around the 10 yard line when the Pats attempted a gadget play. As you can see above, almost everything Roseman touched in 2017 turned to gold. What a season. #JimmyVerdict: I think Howie is safe. 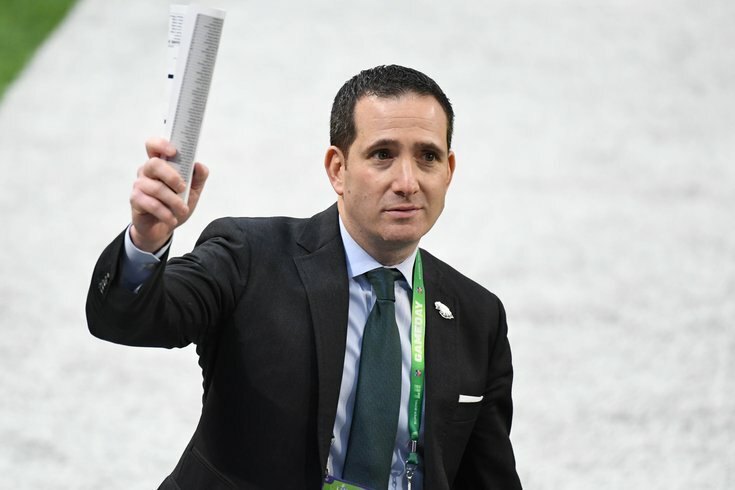 Howie Roseman: Stay or Go?